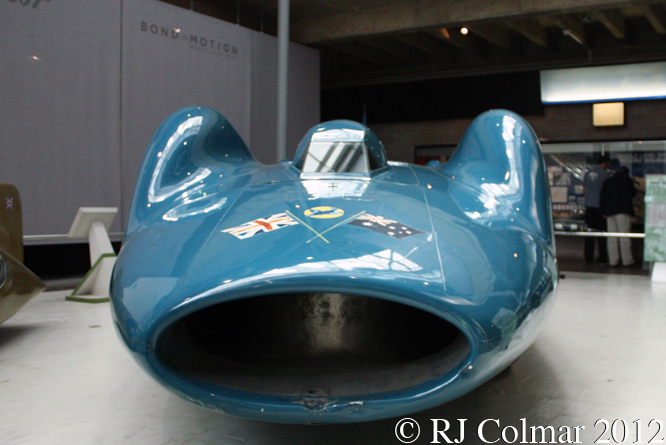 Between 1955 and 1964 Donald Campbell, son of Sir Malcom, set 6 World Water Speed records in the remarkable jet powered hyroplane Bluebird K7. 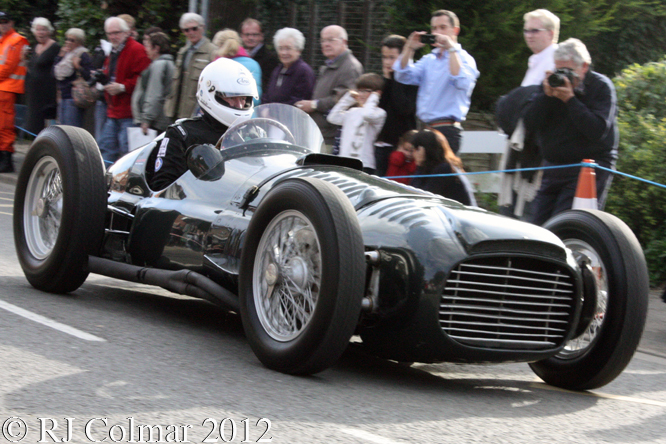 Equally remarkably during much of this time Donald was also raising the funds for todays featured Bluebird-Proteus CN7 for an attack on the 394 mph land speed record which had been set by John Cobb driving the Railton Mobil Special in September 1947. 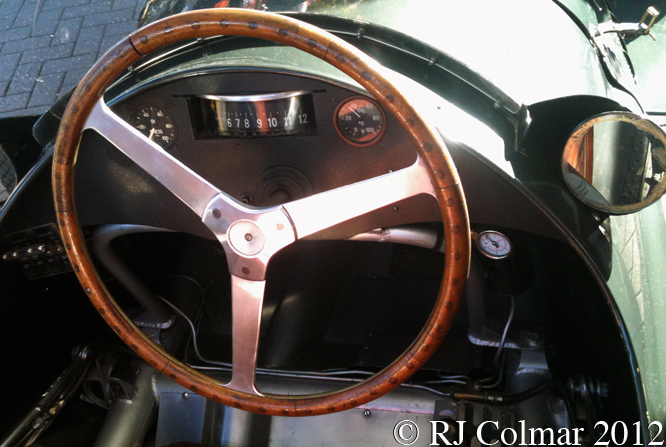 After Donald had set a new water speed record of 202 mph with his K7 hydroplane he asked it’s designers Lew and Ken Norris if they would like to design and build today’s featured record breaking car. The Norris brothers set about devising possibly the worlds most sophisticated motor vehicle with a monocoque chassis housing a modified 4,450hp Bristol-Siddeley Proteus turbo prop motor that delivers power through two gearboxes to the front and rear axles which in turn drive the independently sprung 52 inch Dunlop wheels. 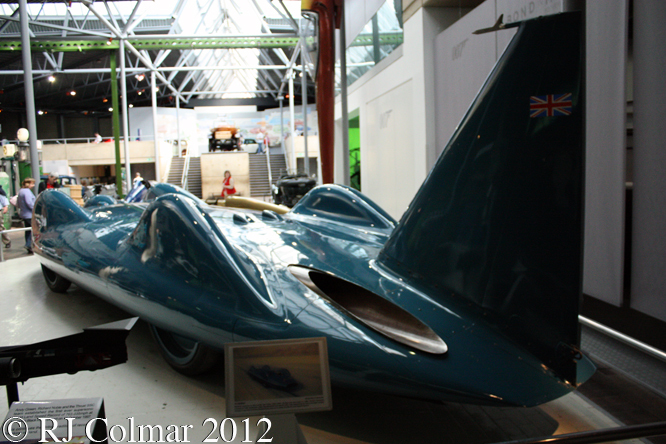 The Norris Brothers and many since anticipated that the Bluebird Proteus CN7 would be capable of 500 mph. 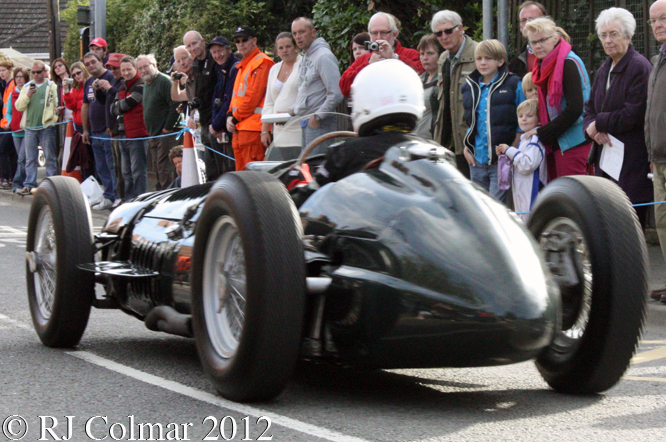 Despite the cars front wheels having only a 4 degree turning angle Donald Campbell gave the CN7 it’s first public outing at Goodwood in 1960 managing a couple of demonstration laps. 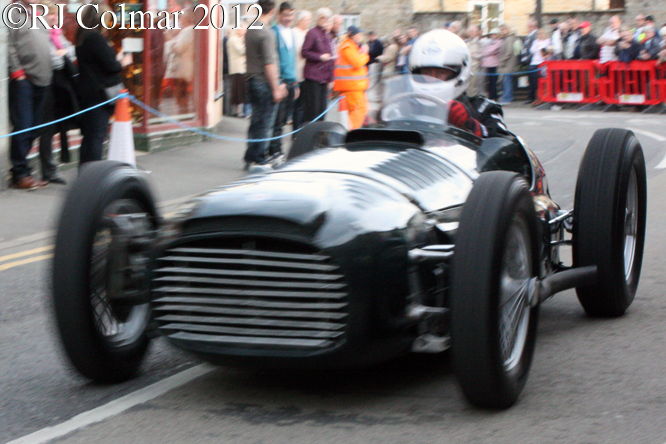 With the engine running at idling speed it still managed to reach 100 mph on the straight. Donald’s first attempts to break the World Land Speed record at Bonneville in 1960 ended with an accident in which he suffered a fractured lower skull and a broken ear drum. 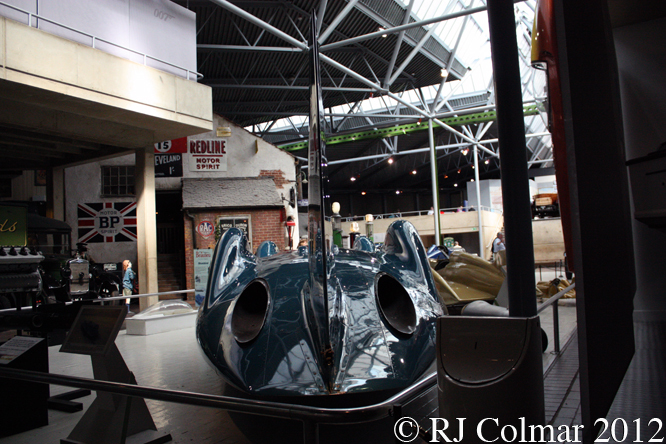 While recuperating Donald learned to fly and rebuilt CN7 for a Land Speed Record Attempt in 1963. Lake Eyre in Australia was chosen not only because more space was available by also because it had not rained there for 20 years… until Donald and CN7 turned up. In 1964 Donald returned to Lake Eyre and without a properly dried out salt surface managed to raise the World Land Speed Record to a disappointing 403 mph, nearly 100 miles an hour short of his target. 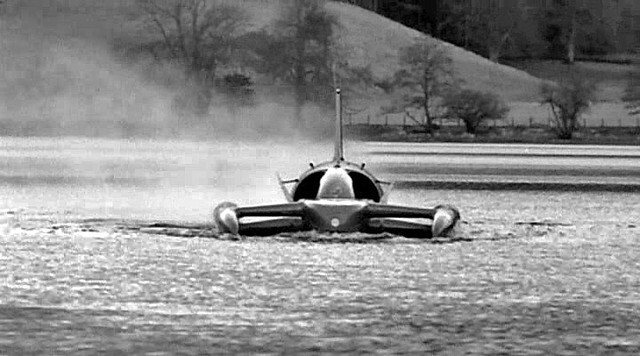 On the 31st of December 1964 Donald became the first man to set World Speed Records on Land and Water in the same year when he set his final new record aboard K7 of 276 mph on Lake Dumbkeyung also in Australia. 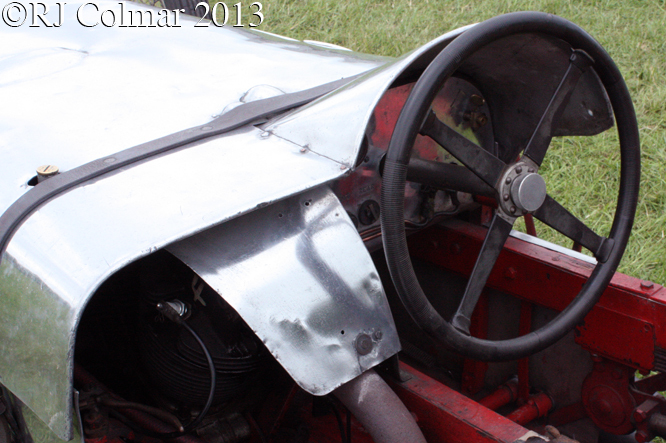 The regulations for land speed records were relaxed to allow thrust powered vehicles without driven wheels shortly after Donald set his record in the four wheel drive CN7. 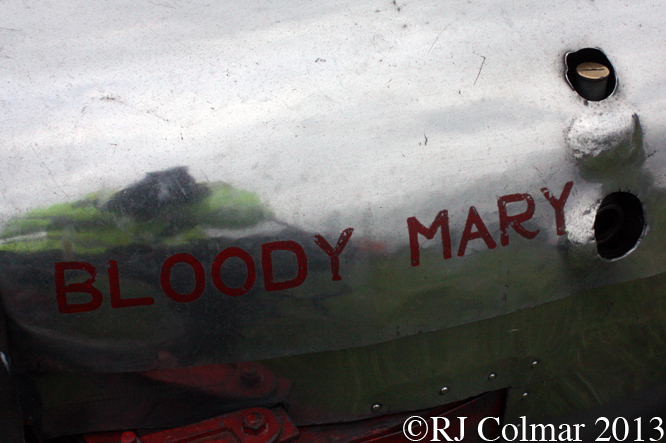 The Norris brothers were envisaging rocket propulsion for a new Bluebird Mach 1.1 vehicle when Donald was killed aboard K7 on Coniston Water in England while he was trying to raise the World Water Speed record on January 4th 1967. 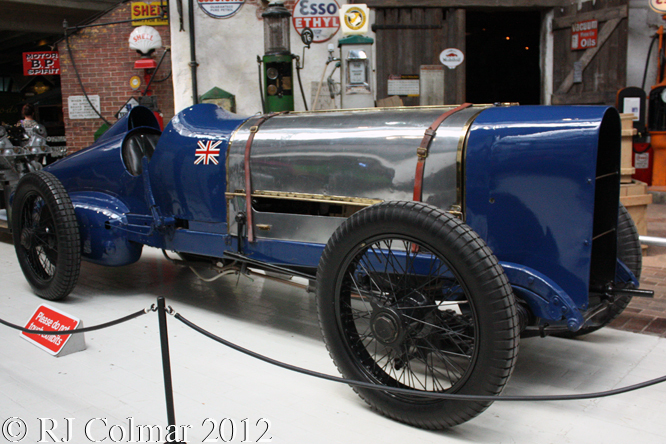 Bluebird Proteus CN7 is seen in these photographs at the National Motor Museum, Beaulieu where it is usually to be found when not out on loan. Thanks for joining me on this “Four Independently Sprung Tons” edition of “Gettin’ a li’l psycho on tyres” I hope you will join me again tomorrow when I’ll be looking at another Triumph Rally car. Don’t forget to come back now ! 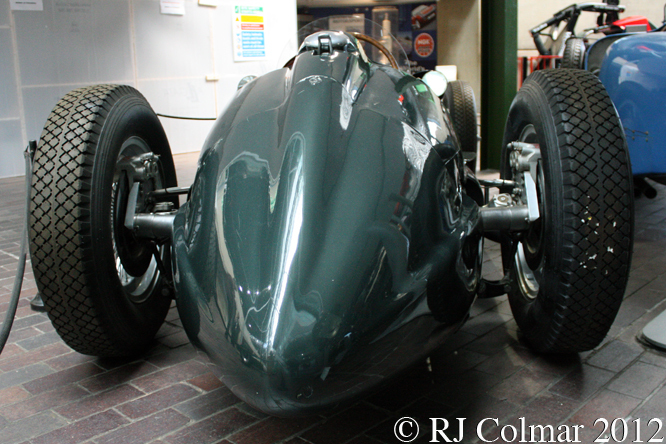 This entry was posted in Uncategorized and tagged Australia, Beaulieu, Bluebird, Bonneville, Bristol Siddeley, Campbell, CN7, Colmar, Dunlop, Goodwood, Lake Dumbkeyung, Lake Eyre, National Motor Museum, Norris, Proteus, Psychoontyres, Ralph on March 27, 2015 by Ralph. These day’s if one had just £500 to spare it would probably not be too difficult to scan a few classified car ads and find a car that was still capable of reaching 150 mph. 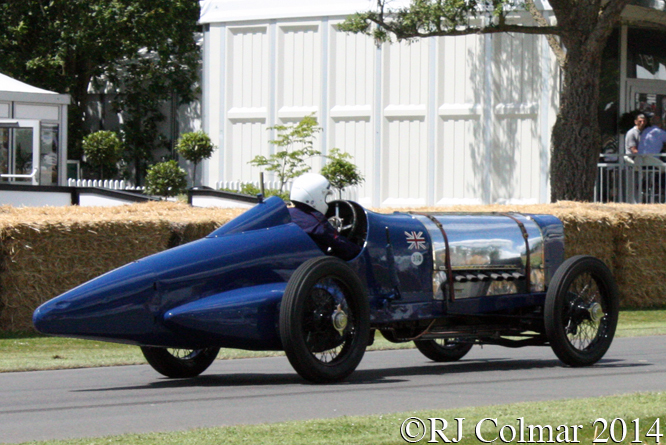 When Sunbeam’s chief engineer and racing team manager Louis Coatalen conceived today’s featured Sunbeam V12 in 1920 the World Land Speed Record stood at 124.09mph / 199.70kph set by Lydston Hornsted driving a 200hp Benz at Brooklands in June 1914. 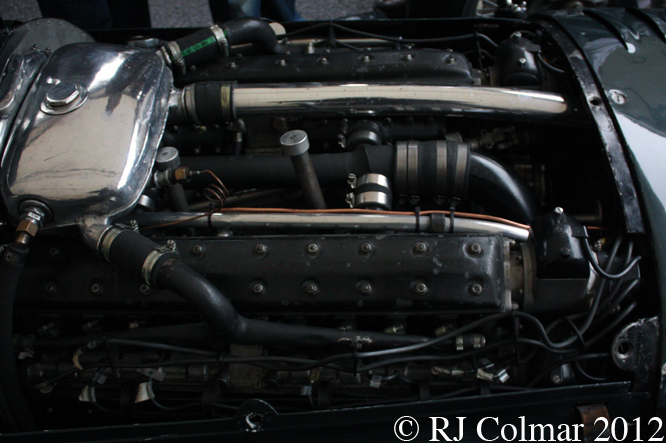 Louis’s idea was to fit a 350 hp 18.3 litre / 1116 cui V12 Sunbeam Manitou V12 aero engine in to a chassis and clad the vehicle in the most aerodynamically slippery shape that could be devised. 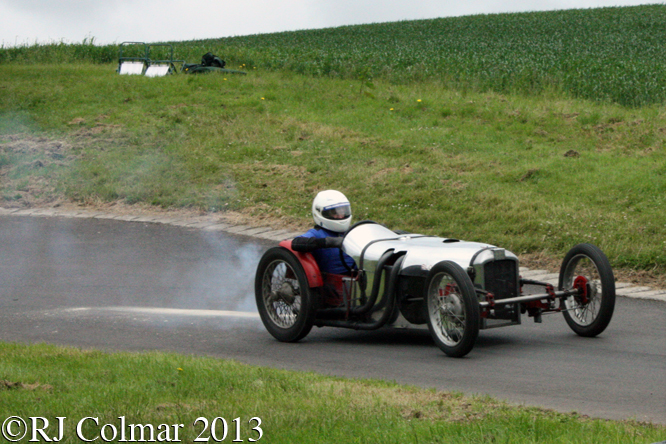 Harry Hawker was given the task of driving the Sunbeam V12 at two Brooklands race meetings in 1920, but the car suffered from damage after a tyre blew on the Whitsun Weekend and then could not start after the engine stalled in August, but René Thomas drove the car to a new 108 mph course record on the Gaillon Hill Climb in France. 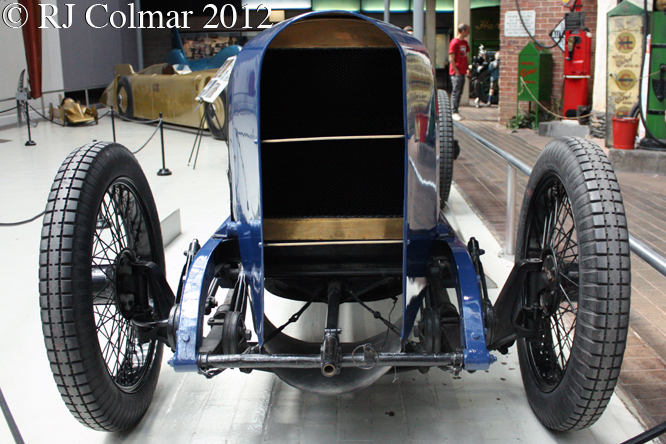 In 1921 Kenelm Lee Guinness drove the car at Brooklands recording a top speed of 140 mph and an average lap speed of 116 mph at the Autumn meeting, the following year Kenelm set a one way flying kilometer record of 133 mph, but this was never recognised as a World Land Speed record for which the speed is determined by the average of two runs in opposite directions. 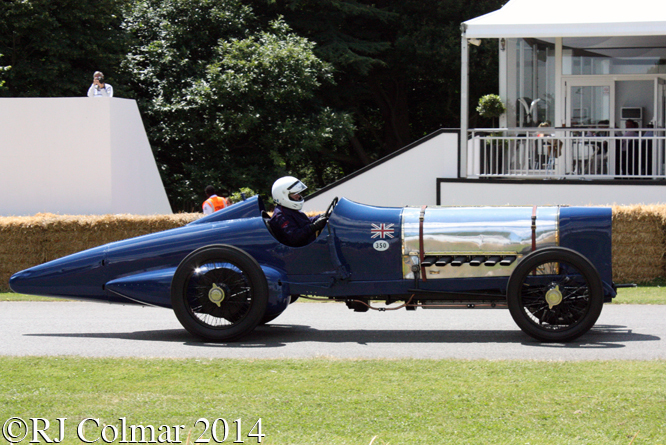 Malcolm Campbell borrowed the Sunbeam V12 to compete in the 1923 Saltburn Speed Trials and recorded a one way run of 138 mph which was enough to convince him that he should purchase the car for further Land Speed Record attempts in 1924. 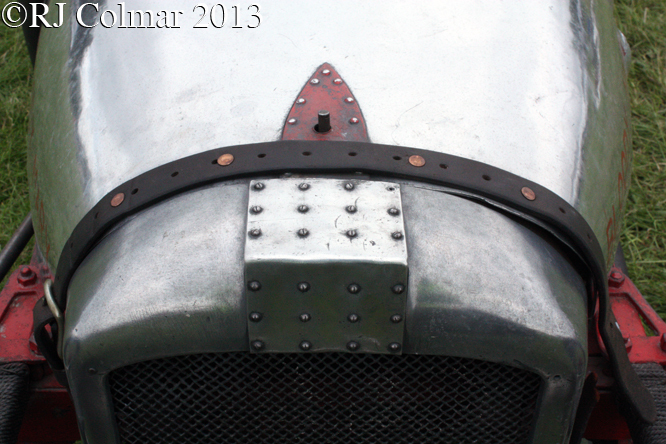 After Ernest Eldridge raised the official Land Speed Record to just over 145 mph aboard the FIAT Mephistopheles, a vehicle I shall be looking at next week, in June 1924 at in Arpajon in France, Malcolm took his now blue and silver, previously green and silver, Sunbeam to the Pendine Sands in September 1924 and recorded a two way average speed of just over 146 mph for his and the Sunbeams first World Land Speed Record. 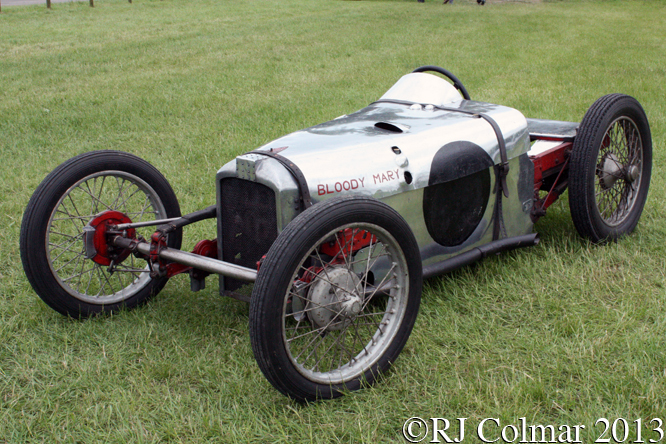 In July 1925 the combination returned to Pendine Sands and raised the World Land Speed Record to 150.87 mph / 242.80 kph a record that stood for just under a year when a car that I shall be looking at in two weeks took the record up to 170 mph. 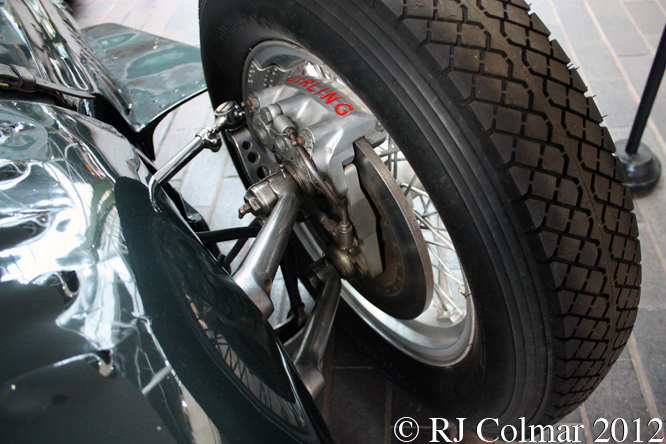 Thanks for joining me on this “150.87 mph / 242.80 kph” edition of “Gettin’ a li’l psycho on tyres” I hope you will join me again for Maserati Monday tomorrow. Don’t forget to come back now ! 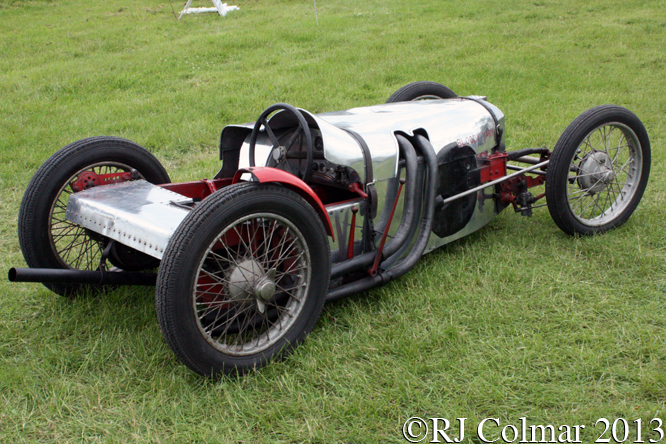 This entry was posted in Uncategorized and tagged Beaulieu, Brooklands, Campbell, Coatalen, Colmar, Festival of Speed, Gaillon, Goodwood, Guiness, Hawker, Hill, Manitou, National Motor Museum, Pendine Sands, Psychoontyres, Ralph, Saltburn, Sunbeam, Thomas, V12, World Land Speed Record on January 11, 2015 by Ralph. 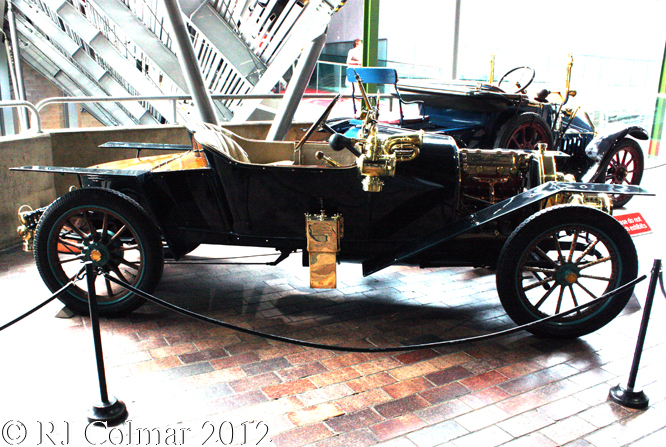 Milanese Ettore Bugatti was working for, the company founded by Nicolas Otto that became, Deutz Gasmotoren Fabrik in Cologne, Germany where he designed his Type 8 and Type 9 between 1907 and 1909 when he decided to build his own car in his basement. 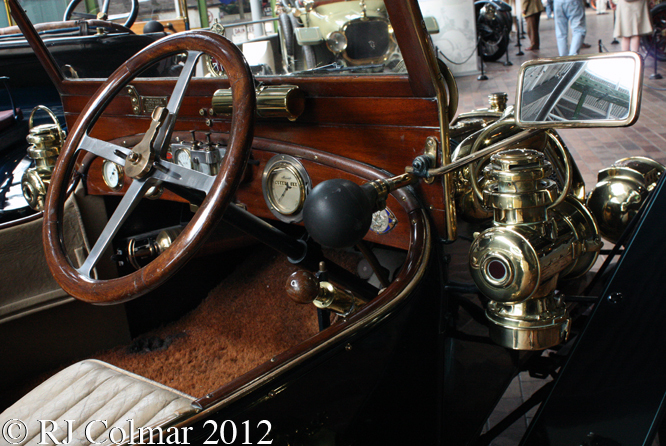 Upon completion of the project, known as the Type 10, in 1909 Ettore packed his possessions and family into his new creation and headed for Alsace to found Automobiles E. Bugatti and look for a factory in which to build more cars of his own design. Settling in Molsheim, Alsace Ettore set about building the Type 13 which like the Type 10 featured advanced, for the period in which chain drive was the norm, shaft drive, a larger 1368cc /83 cui version of the 4 cylinder Type 10 motor and for racing variants only cutting edge of technology 4 valve heads. 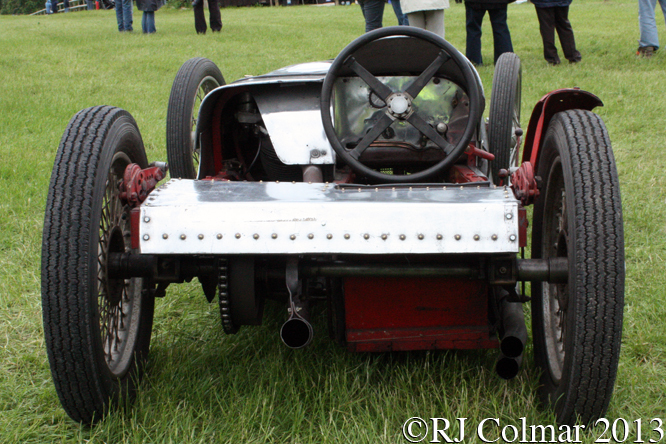 Unlike the Type 10 which only had leaf springs at the front and an unsprung rear axle the Type 13 featured leaf springs all round. 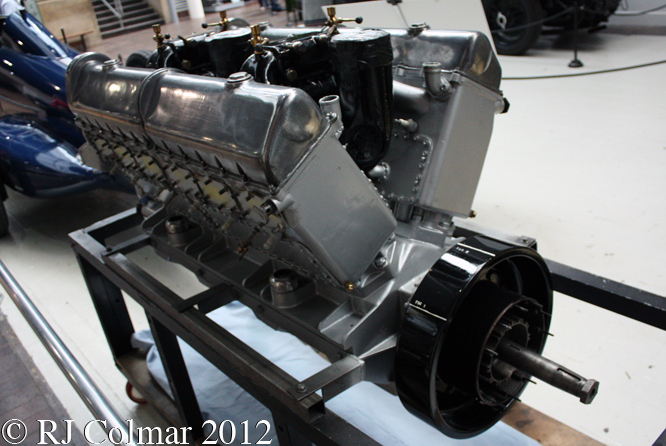 The 16 valve Type 13 produced around 30 hp at 4,500 rpm an extraordinary high output for such a small motor thanks to the 4 valve heads, bearing in mind that the slightly earlier 35/45 hp Itala required a 7.4 litre / 453 cui motor to produce only 5 – 15hp more. 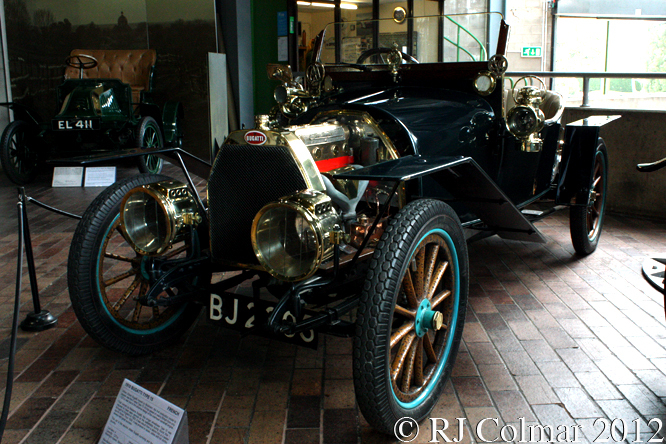 Automobiles E. Bugatti produced 5 Type 13’s in 1910 and in 1911 Ernest Friderich drove one of them in the 7 hour marathon French Grand Prix in which he finished 2nd, albeit 2 laps down, to the winning 10 litre / 589 cui 4 cylinder FIAT S61 driven by Victor Hemery. 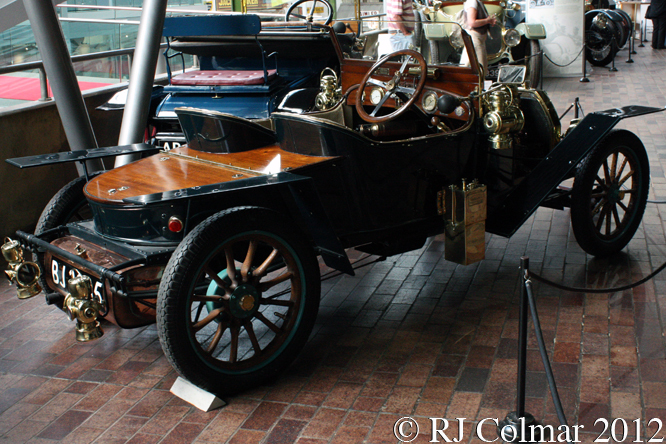 Today’s featured 1910 Type 15 is similar to the Type 13, except that it was built with a longer chassis, 14 inch longer wheel base and is fitted with a 15hp 8 valve motor number #16. 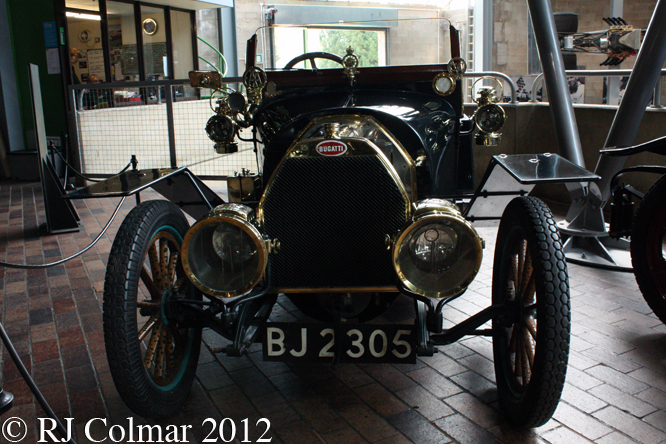 This car, seen at the National Motor Museum at Beaulieu was first owned by Ettore’s wife Mdme Barbra Bugatti and fitted with a saloon / sedan body. Before being registered in the UK by Col. Dowson in 1921, #366 is said to have been of service on the battlefields of the 1914 – 18 war. 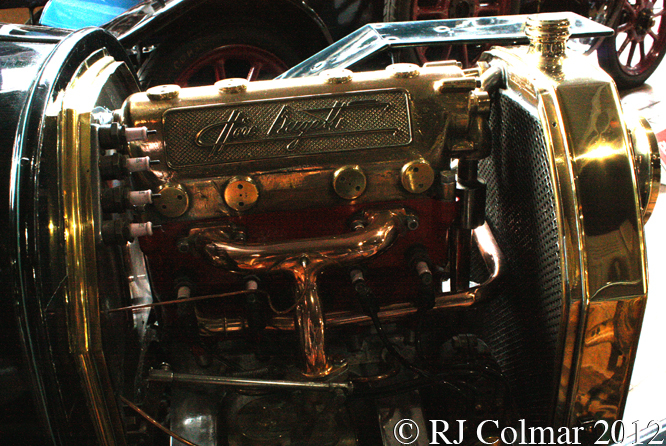 The next known owner of #366 was Bugatti enthusiast CWP ‘Peter’ Hampton, the head of an international firm of land agents who lived in Effingham Common, Surrey and later Bolney, Sussex where he tended his collection reported to include Rolls-Royces, Mercedes Benz of all ages, at least one Hispano Suiza and 25 Bugattis, one of which was ‘recovered’ from Czechoslovakia in what has been described as a James Bond style operation when the country was still heavily under Soviet influence behind the Iron Curtain. 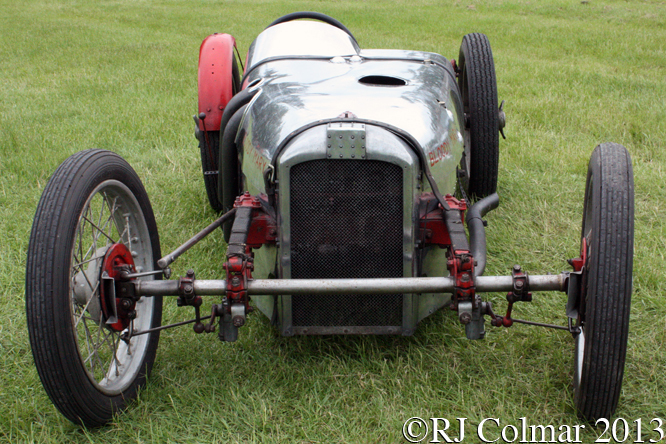 Peter replaced the original saloon / sedan body on #366 for the 2 seat sports tourer seen today in the 1930’s and used to compete with it regularly at Prescott along with four of his other competition Bugatti’s which included a Type 13, Type 18, Type 30, and Type 57C of which the Type 15 was unsurprisingly the slowest having achieved a best time of 80.7 seconds. 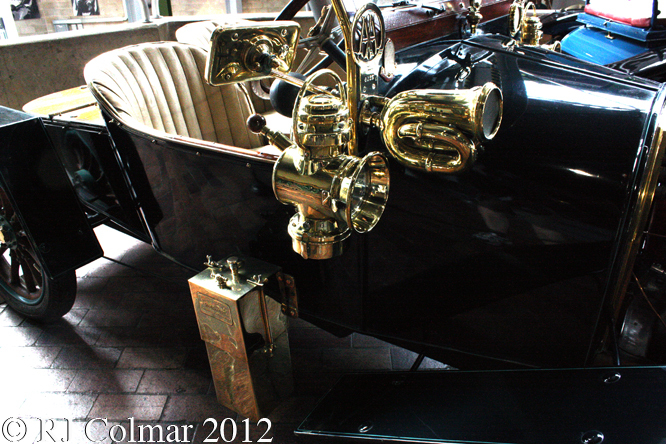 The highly polished brass box above is an acetylene gas generator, for the gas powered headlights, which featured a Patented Automatic Shaking Grate Generator manufactured by Rushmore Dynamo Works at Plainfields N.J., U.S.A between 1905 and 1914 when the company was bought for $750,000 cash by Bosch Magneto Co.
During the ’39 – ’45 war, Peter served as a War Substantive Lieutenant in the 4th/7th Royal Dragoon Guards, Royal Armoured Corps and was in the first wave to land at Gold Beach in the D-Day landings at Normandy in support of the infantry regiments. Five of the 4th/7th’s tanks were lost before making shore despite being dropped off 200 yards from the beach, instead of the planned two miles, because of the unexpectedly high seas. 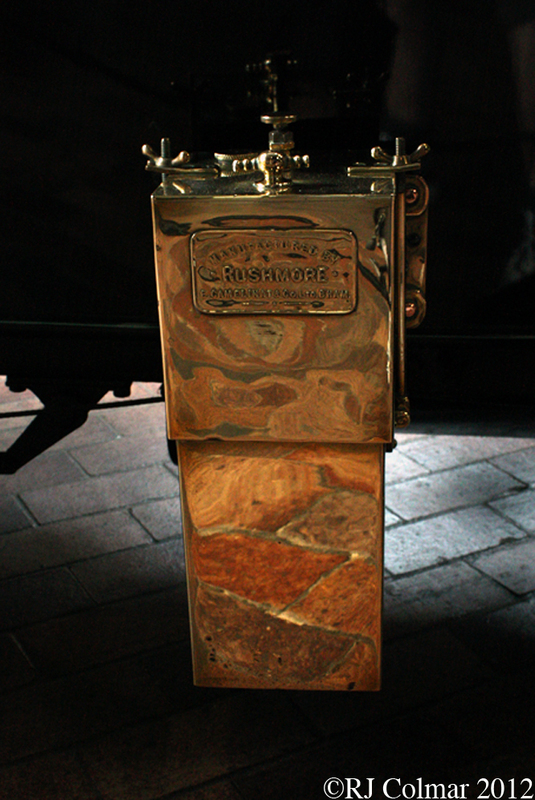 During the landings Peter received a permanent shrapnel injury to his left arm which was henceforth completely unusable, after relinquishing his commission due to his injuries Peter returned to Suffolk where his cars had been kept in working condition by farmer Stanley Sears, father of two time British Saloon / Sedan champion Jack. 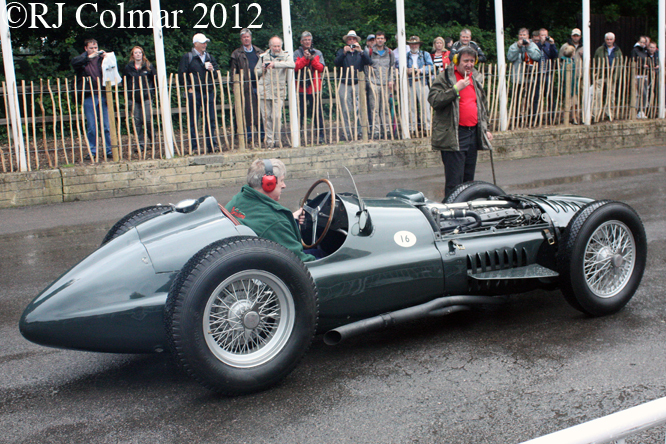 To over come the problem of his left arm Peter had Stanley convert all of his vehicles to right hand gear change and Peter kept competing at Prescott and other events with #366 until 1952. 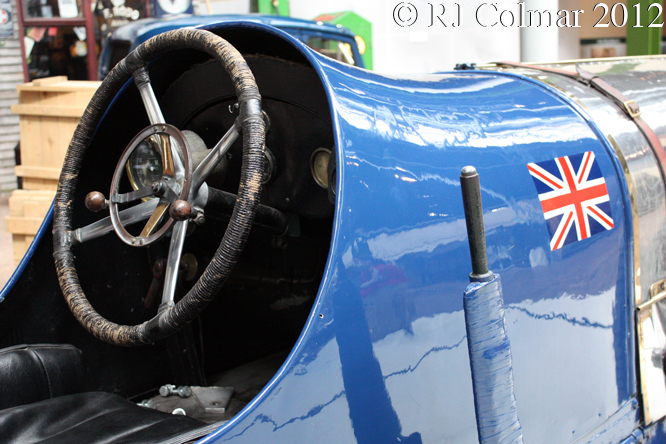 #366 is the oldest example of the marque in the UK and thought to be the second oldest Bugatti in the world and it along with the rest of the cars in Peter’s collection were dispersed after his death in the 1980’s. Although #366 is road fund licence exempt it has not been issued with a valid tax exempt disc since 1985, though ironically, the vehicle actually belongs to Her Majesties Government who acquired it from Peter Hampton’s estate in lieu of inheritance tax. My thanks to Allan Lupton for enlightening me about the Rushmore Dynamo Works Patented Automatic Shaking Grate Acetylene Generator, to Doug Nye, Roger Lund, John Winfield, Vitesse2, Carl R.S. and Hipperson who all contributed to the ‘C.W.P. ‘Peter’ Hampton; racing driver and collector’ at The Nostalgia Forum and likewise to everyone who contributed to the ‘great bugatti collectors’ thread at Bugattibuilder.com forum. 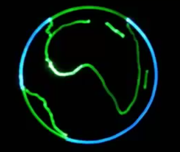 Thanks for joining me on this “The Tax Man Has Taken All My Bugs” edition of “Gettin’ a li’l psycho on tyres” I hope you will join me again tomorrow when I’ll be looking at McLaren’s 50th Anniversary efforts in the 2013 Formula One season. Don’t forget to come back now ! 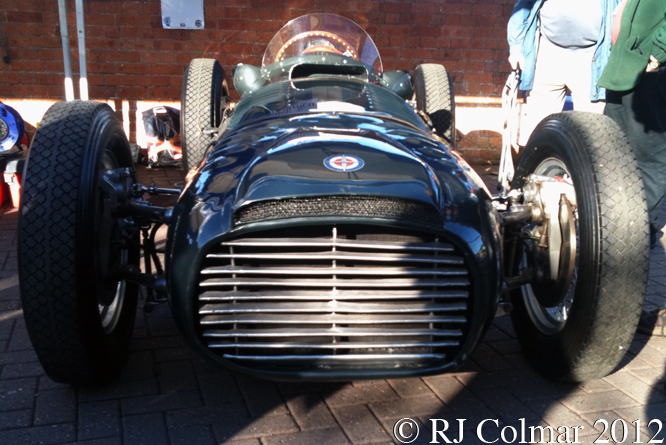 This entry was posted in Uncategorized and tagged Alsace, Beaulieu, Bugatti, Colmar, Dowson, French GP, Friderich, GALPOT, Hampton, HM Government, inheritance tax, Le Mans, Molsheim, National Motor Museum, NJ, Plainfields, Ralph, Rushmore Dynamo Works, Sears, Type 15 on February 18, 2014 by Ralph. 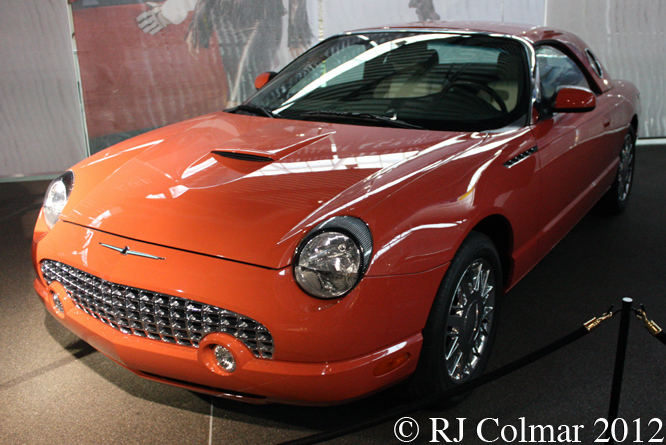 Ford revived the Personal Luxury Thunderbird model in 2002 following the success of various retro models including the the VW Golf based Beetle, and BMWs all new retro look Mini and Chryslers retro P/T Cruiser Ford designers took styling cues for the rebirth of the the Thunderbird name, which disappeared in 1997, from the 1954 first generation Thunderbird. 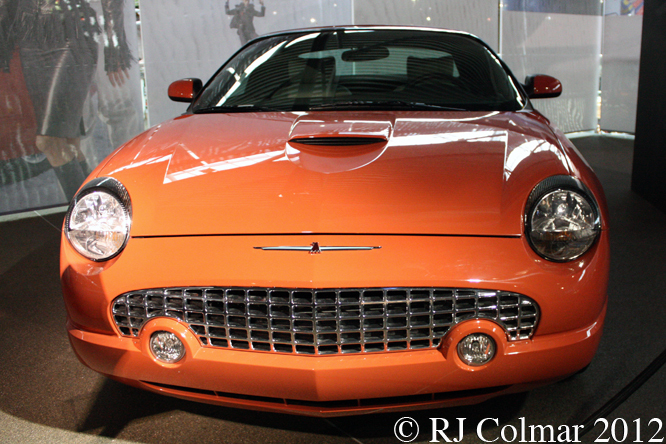 The new Thunderbird turned heads where ever it went according to one journalist and received the Motor Trend Car Of the Year Award from an adoring press. 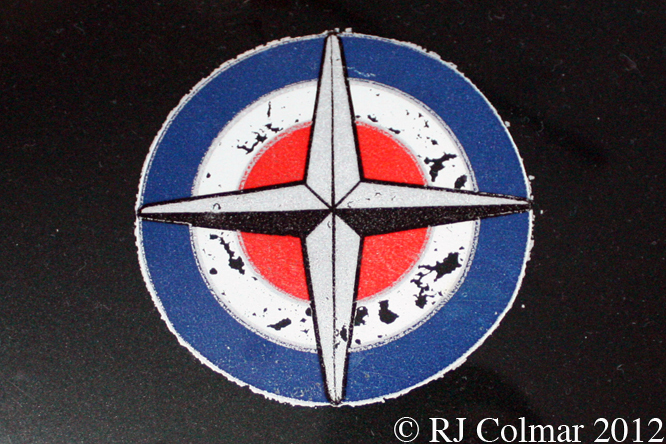 For a short time 11th Generation Thunderbirds even sold at a premium off the forecourts however Ford chose not to back it’s new jewel with the kind of marketing to which the public for luxury trucks had become accustomed and so just 19,000 Thunderbirds were sold in 2002 about a fifth short of what had been anticipated. Despite cameo appearances in the 2004 science fiction kids film Thunderbirds an marginally more adult orientated 2002 James Bond thriller Die Another Day in which Bond’s side kick US agent Jinx played by Halle Berry appeared in today’s all Coral coloured car. 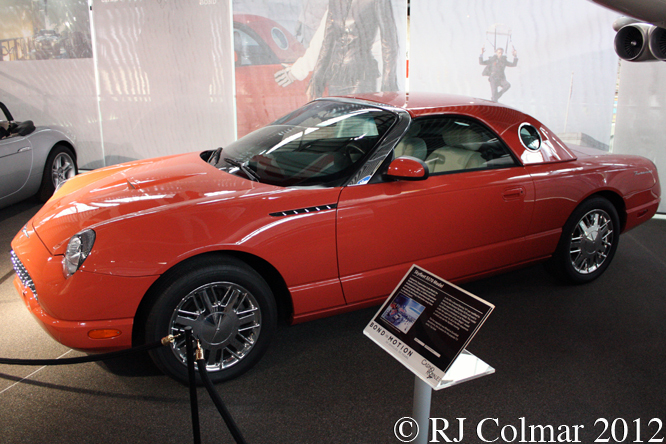 Unfortunately the lack of marketing, and possibly the lack of performance options which appear to have been lavished by the bucket load on the 2005 retro futurist Sid Ramnarace designed Ford Mustang, killed the Thunderbird off for a second time in 2005 with just 67,518 examples produced including a limited production run of 700 for the 007 special edition commemorating “Die Another Day”. Thanks for joining me on this “Die Another Day” edition of “Gettin’ a li’l psycho on tyres” I hope you will join me again tomorrow for Ferrari Friday when GALPOT will be paying a second visit to Niello Serrano Concours d’Elegance. Don’t forget to come back now. 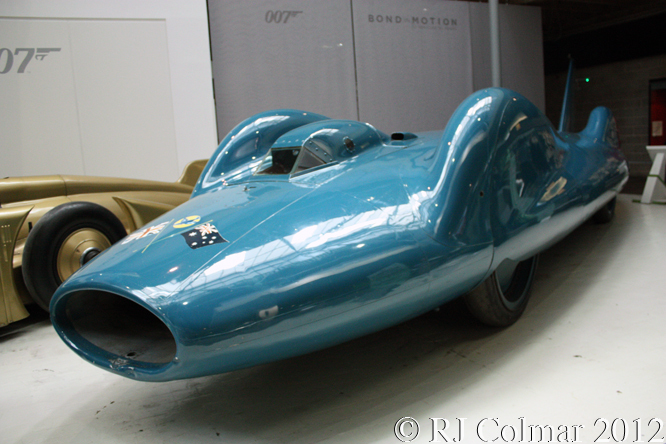 This entry was posted in Uncategorized and tagged #007, Beaulieu, Berry, Bond, Colmar, Die Another Day, Ford, GALPOT, Jinx, Motor Trend, Mustang, National Motor Museum, Personal Luxury, Ralph, Ramnarace, Thunderbird, Thunderbirds on October 31, 2013 by Ralph.